NCDOT Takes A2-V27 System from The Initiative in Querious! 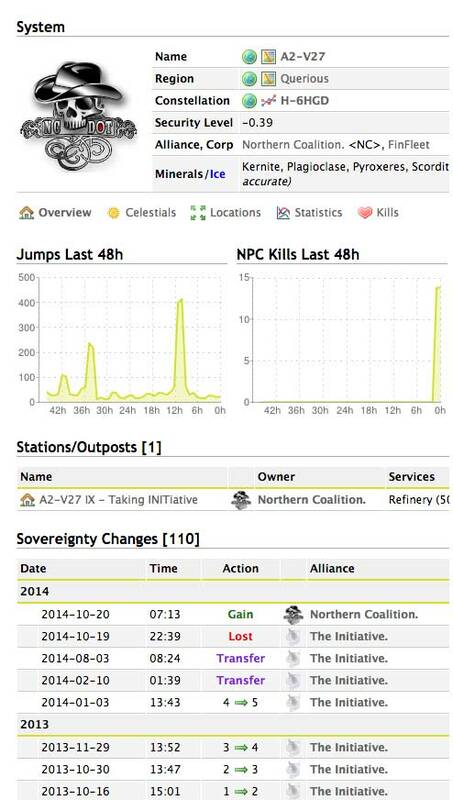 On the 15th of October, NCDOT began their assault by reinforcing A2-V27 in US TZ resulting in EU TZ timers on Friday, with the exception of the IHUB, which was Thursday. The IHUB fell uncontested by the CFC and so it was put into its final reinforcement timer, exiting late EU on Saturday. On Friday, the rest of the timers were coming out of reinforced and Kcoler, on of the CFC FCs, had pinged for around 36 hours so that they could form a fleet to fight NCDOT. By 18:00, his persistent pinging resulted in a CFC fleet of approximately 900 pilots stretching from YAO to Delve. In support, INIT formed what Vince Draken described as ”the biggest fleet he had seen them field”; a 250 man fleet. NCDOT knew that CFC was able to support INIT with large numbers and had reinforced all jump bridge POSes that CFC would use to get to Querious. this meant that CFC had to use titans, which would slow their long march to the battlefield. In total, NCDOT had formed 379 pilots in Gehi, while other N3 groups filled up a Tengu fleet and Nulli Secunda brought a 120 man Cerberus fleet. PASTA decided to support N3 as well and deployed their infamous bomber fleet. With all fleets ready, N3 and Co. decided to start moving. NCDOT managed to get their 250 man Tengu fleet into the system first, followed by a full Tengu fleet let by Sort Dragon. 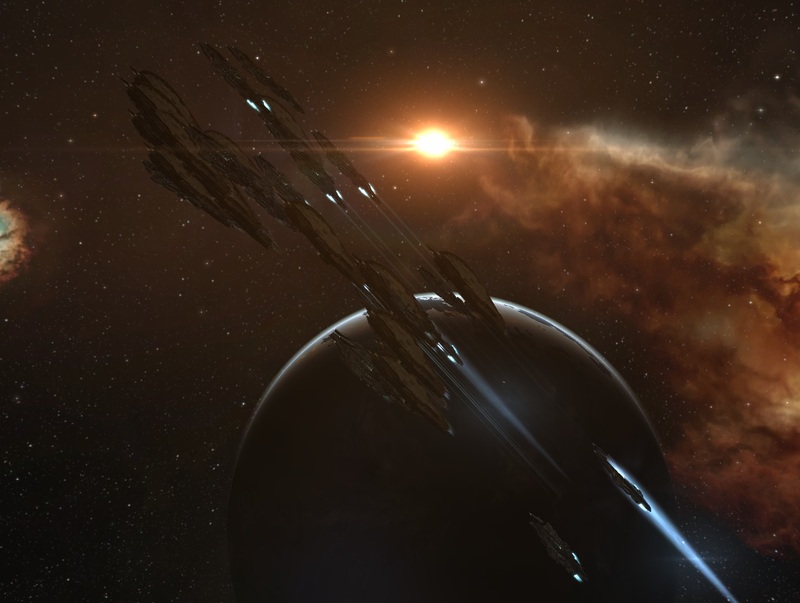 The 120 man Nulli Secunda Cerberus fleet was next to jump in, bringing the local count up to 740. Earlier, NCDOT had logged their super fleet outside of their POS in system, but with the system filling up the order was given to log in. A total of 110 super carriers followed this command, putting local at 850 pilots. Everything was now set to rock and roll. However, CFC/INIT never showed up to the party, claiming that they couldn’t fight without the CFC capital fleet to back them up. CFC/INIT all moved back to their homes, docked up and stood down. This resulted in N3 pushing the system into the final reinforcement timer. After this abject failure, the CFC didn’t bother to form for any timers created by NCDOT in Querious. At 22:34 last night the A2-V27 Station fell, uncontested, to 350 NCDOT pilots. Is INIT/CFC not worried about Querious? Are they planning something else, preventing them from moving to that particular region or that far across the universe? Are they too scared? These are just a few questions coming to my mind when typing this out. All in all, I’m sure that we will see some interesting developments, and I will be sure to report on these after they happen! Hi there. I found your website via Google while looking for a related subject, your website came up. It appears to be good. I have bookmarked it in my google bookmarks to come back then. Hi there. I found your site by means of Google whilst searching for a related topic, your website came up. It looks great. I’ve bookmarked it in my google bookmarks to come back then. Hiya, I’m really glad I’ve found this info. Today bloggers publish just about gossip and internet stuff and this is really frustrating. A good website with exciting content, this is what I need. Thanks for making this website, and I’ll be visiting again. Do you do newsletters by email? Howdy! I just want to offer you a big thumbs up for your great information you have got right here on this post. I am coming back to your website for more soon. Hiya, I am really glad I have found this information. Nowadays bloggers publish just about gossip and web stuff and this is really frustrating. A good blog with interesting content, this is what I need. Thank you for making this web site, and I’ll be visiting again. Do you do newsletters by email? Hi there. I found your website via Google at the same time as looking for a comparable subject, your web site got here up. It appears to be good. I have bookmarked it in my google bookmarks to visit then. Hi there. I found your blog by means of Google whilst searching for a comparable topic, your site got here up. It seems to be good. I have bookmarked it in my google bookmarks to visit then. Hi there. I found your site by way of Google whilst looking for a related matter, your site got here up. It seems to be great. I’ve bookmarked it in my google bookmarks to come back then. Hello there. I found your website by means of Google whilst searching for a comparable subject, your web site came up. It appears good. I’ve bookmarked it in my google bookmarks to visit then. I have to show my gratitude for your kind-heartedness in support of all those that really want help with your area. Your real dedication to getting the solution up and down had been exceedingly valuable and have continuously empowered most people like me to arrive at their dreams. Your own warm and friendly guideline denotes this much to me and especially to my mates. Thank you; from all of us. Simply wish to say your article is as surprising. The clearness in your post is just great and i could assume you are an expert on this subject. Well with your permission allow me to grab your RSS feed to keep updated with forthcoming post. Thanks a million and please carry on the gratifying work. Hello there. I discovered your website by way of Google even as searching for a comparable topic, your website came up. It seems to be great. I’ve bookmarked it in my google bookmarks to visit then. Hiya, I’m really glad I’ve found this information. Today bloggers publish only about gossip and web stuff and this is actually frustrating. A good website with exciting content, this is what I need. Thank you for making this web-site, and I will be visiting again. Do you do newsletters by email? Hey there. I discovered your web site by the use of Google while searching for a comparable topic, your website got here up. It seems to be good. I’ve bookmarked it in my google bookmarks to visit then. What are some truly good poetry blogs or sites to post journal entrances? Hello there. I discovered your blog by the use of Google while looking for a comparable matter, your site came up. It appears to be good. I’ve bookmarked it in my google bookmarks to come back then. Leave a Reply to wedding decoration Click here to cancel reply.